Amir Michalovich is a PhD student in the Language and Literacy Education Department. He is interested in multimodality in education, particularly the ways in which multimodal meaning-making can facilitate immigrant and refugee students’ engagement and integration in school learning. Amir intends to study how inquiry-based learning which is rooted in multimodal composition relates to synaesthetic meaning-making, its considerable potential for multilingual education, and the ways in which its endorsement might elevate the education of diverse learners, particularly youth refugees. Through his PhD, Amir intends to form an empirically-based theoretical framework for enacting change in educational policy, that will nevertheless provide flexible routes for application in diverse contexts. 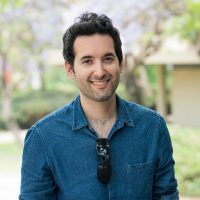 His past experience includes managing a research project – A New Multilingual Education Policy for Israel, filmmaking, teaching, and mentoring community-based filmmaking groups. He is a professional ATLAS.ti trainer, and works at Research Commons as a Graduate Student Peer for Data Analysis Software. 1. Multimodal Literacies, 2. Digital (Media) Literacy, 3. Classroom Discourse, 4. Education Policy, 5. Adolescent Literacy.